If you're sick of 'fluffy' marketing and want a team of people to help you to really drive new business, you came to the right place. 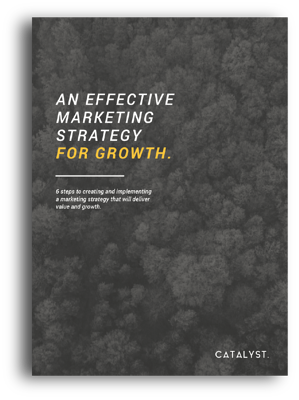 What is Growth Driven Marketing? We focus on improving your operations, sales and marketing to ensure your entire business is geared for growth. If you can’t deliver or retain what marketing and sales bring in, your growth will be short-lived. Your sales strategy should bridge the gap between your operations and marketing strategy. Aligning marketing with sales and operations ensures your business is in front of the right prospects. Wait, do you even need a marketing agency? You might think it's a bit weird a marketing agency asking you that, but we'd hate to waste your time with calls and meetings if you don't need an agency in the first place. Click below to take the test. When integrated and aligned our range of specialist services will help gear your business for growth and drive the right kind of opportunities. "We're very happy with the work Catalyst have delivered. They always deliver on time and are available 24/7 for questions. The work done is always above what we expect and the management of the entire project always smooth." "We chose Catalyst as they understand how to challenge a brief and create websites that actually deliver; in this instance they helped us to cement our position as the global thought-leader in lightweight design." "As well as shaping our marketing strategy, we’ve relied on Catalyst to create everything from e-mail campaigns to our internal magazine - the results always speak for themselves."